Have a question not answered below? Visit our contact us page to see the different ways you can get in touch. What kind of work does R&F do? R&F Construction specializes in disaster cleanup and property renovation. Whether you've got a question about dealing with storm damage, or you're interested in updating your kitchen, give one of our service representatives a call at 1-800-228-7739. R&F is a DKI member - what does that mean? R&F Construction's membership in DKI Canada means we can access and coordinate resources (equipment or labour) from other DKI members, to address large-scale disasters or deal with concurrent issues. This means that no matter how big your problem, or how time critical the response, R&F is prepared to respond! Can R&F handle an insurance claim? R&F Construction can help you throughout the entire claims process. We want to make your property recovery as simple and stress-free as possible. Call 1-800-228-7739 for more information, or complete our Contact Us form and we'll get in touch. Can R&F help if I don't have insurance? R&F Construction has financing programs available to help get you back to a pre-loss condition without breaking the bank. If the damage isn't covered by your insurance company, call 1-800-228-7739 for a consultation. In most cases, we will be able to work with you to form a mutually agreeable plan. At R&F Construction, we know that emergencies don't stick to regular business hours, so we are available 24 hours a day, 7 days a week. Our amazing representatives are always ready to help when you call 1-800-228-7739. What areas does R&F serve? R&F Construction directly serves the communities of Orillia, Barrie, Simcoe County, Muskoka, Parry Sound and surrounding areas. As part of the DKI network, R&F has assisted in large scale emergency projects as far away as British Columbia. In short, R&F is where you need us to be, so no matter where you are, get in touch with us at 1-800-228-7739, or complete the request form on our Contact Us page and we'll follow up with you. What kind of trade services does R&F offer? From concept to design to build, R&F Construction offers a multitude of trade services including, but not limited to: asbestos and mold removal, general construction, carpentry, drywall, electrical, painting, HVAC (heating, venting, air conditioning), plumbing, design, framing, roofing, flooring, cabinetry, wallpaper, specialty finishes, trim, doors, windows, siding and more. Call 1-800-228-7739 to discuss the scope of your project needs and how we can help. What kind of equipment does R&F have for cleanup? When R&F Construction is called upon to assist with disaster cleanup, whether from a fire, spill or water damage, we often address the problems onsite using heavy duty appliances such as dehumidifiers, air movers and air filtration units. For portable items that need fabrication, restoration or cleaning, R&F has facilities and equipment at our locations to rebuild, repair or refresh almost anything! 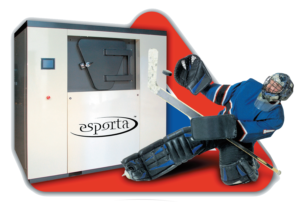 R&F Construction even offers deodorizing and cleaning services for smelly and hard-to-wash sports equipment, using an incredible machine manufactured by Esporta. Call 1-800-228-7739 to discuss getting rid of any bad odors, whether from hard luck, hard work or hard play!